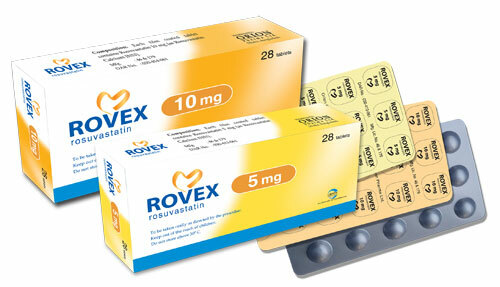 Rovex 5 Tablet: Each film coated tablet contains Rosuvastatin Calcium INN equivalent to 5 mg Rosuvastatin. Rovex 10 Tablet: Each film coated tablet contains Rosuvastatin Calcium INN equivalent to 10 mg Rosuvastatin. The usual recommended starting dose of Rosuvastatin is 10 mg once daily. Initiation of therapy with 5 mg once daily may be considered for patients requiring less aggressive LDL-C reductions or who have predisposing factors for myopathy. For patients with marked hypercholesterolemia (LDL-C > 190 mg/dL) and aggressive lipid targets, a 20 mg starting dose may be considered. The 40 mg dose of Rosuvastatin should be reserved for those patients who have not achieved goal LDL-C at 20 mg. After initiation and/or upon titration of Rosuvastatin, lipid levels should be analyzed within 2 to 4 weeks and dosage adjusted accordingly. The recommended starting dose of Rosuvastatin is 20 mg once daily in patients with homozygous FH.The maximum recommended daily dose is 40 mg. Rosuvastatin should be used in these patients as an adjunct to other lipid-lowering treatments (e.g., LDL apheresis) or if such treatments are unavailable. No modification of dosage is necessary for patients with mild to moderate renal insufficiency. For patients with severe renal impairment (CLcr<30 mL/min/1.73 m2) not on hemodialysis, dosing of Rosuvastatin should be started at 5 mg once daily and not to exceed 10 mg once daily. In Asian patients, consider initiation of Rosuvastatin therapy with 5 mg once daily due to increased Rosuvastatin plasma concentrations. The increased systemic exposure should be taken into consideration when treating Asian patients not adequately controlled at doses up to 20 mg/day. In patients taking Cyclosporine, the dose of Rosuvastatin should be limited to 5 mg once daily. In patients taking Lopinavir and Ritonavir or Atazanavir and Ritonavir the dose of Rosuvastatin should be limited to 10 mg once daily. Rosuvastatin is generally well tolerated. The adverse events seen with Rosuvastatin are generally mild and transient. Most commonly occurring side-effects are headache, myalgia, asthenia, constipation, dizziness, nausea, abdominal pain. Uncommonly pruritus, rash and urticaria may occur. Myopathy (including myositis), hypersensitivity reactions (including angioedema), rhabdomyolysis, pancreatitis etc are the rarely occurring side-effects of Rosuvastatin. Caution should be takenin patients with thyroid problem, have family history of muscular disorder, had any past problems with muscles (pain, tenderness), after using an HMG-CoA reductase Inhibitor (statin) such as atorvastatin, fluvastatin, lovastatin, pravastatin or simvastatin or have developed an allergy or Intolerance to them. Erythromycin: Co-administration of Erythromycin with Rosuvastatin decreased AUC and Cmax of Rosuvastatin. Itraconazole: Itraconazole increases the AUC of Rosuvastatin. Fluconazole: Co-administration of Fluconazole with Rosuvastatin increases the AUC of Rosuvastatin. Warfarin: The pharmacokinetics of Warfarin is not significantly affected following co-administration with Rosuvastatin. Cyclosporin: Co-administration of Rosuvastatin with cyclosporin resulted in no significant changes in Cyclosporin plasma concentration. Gemfibrozil: Concomitant use of Rosuvastatin and Gemfibrozil resulted in a two-fold increase in Cmax and AUC. Antacid: The simultaneous dosing of Rosuvastatin with an antacid suspension containing Aluminium and Magnesium hydroxide resulted in a decrease in Rosuvastatin plasma concentration of approximately 50%. There are no clinically significant interactions with an oral contraceptive, Digoxin, Fenofibrate, antihypertensive agents, antidiabetic agents and hormone replacement therapy.